Ralph Buell was the interviewer. Buell retired from Texas Operations, Dow Chemical Co. as Manager of Human Resources. Monroe Shigley retired from Dow Chemical on Aug 1, 1970. The complete interview was given to me by the Buell family. The original document was created on a typewriter. This paper is submitted by Howard Hewett, retired from Texas Operation, Dow Chemical, Co.
My connection to this project is that I was a Federal Point Ethyl Dow Brat 1939-1956. The full narrative of Monroe Shigley’s oral history of his years in Kure Beach begins following the images below. Here is the relevant portion of the interview with Monroe Shigley, after he retired. Questions were presented by Ralph Buell. 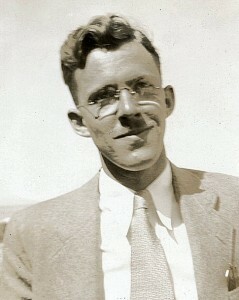 At the Dow plant in Midland, Michigan, Fred Heinie Langell was involved in developing a process for taking bromine out of seawater. The use of tetraethyl lead in gasoline was growing by leaps and bounds in those days (1920s) to the point that Dow with its brine supplies could not hope to provide the increasing amounts of ethylene dibromide which had to be added to tetraethyl lead to make the antiknock fluid. I was to become involved with this process development, but before getting to that, let me back up a few years. Herbert Dow’s interest in bromine had caused him to look into seawater as a source, and he had sent a man by the name of Joe Bayless around the shores of the country to determine salinities at various places. To determine the salinities he had a little gadget consisting of a number of glass balls of varying densities. He would report the number of balls that floated in his water samples. At one time Mr. Harlow let me read the reports. Joe was interested in people and would tell about the folks he had met. One report I recall told about a fellow who had a bad case of boils, told about his family, and at the end said that the seawater there floated three balls. Or maybe it was four. Aerial view from Cape Fear River outfall (lower) to Atlantic Ocean intake. From Bayliss’ work and later studies by Roy Osmun, a shoreline of the Atlantic Ocean near Wilmington, North Carolina was chosen as a place where the salinity was fairly high, although not as high as at Baffin Bay in Texas. 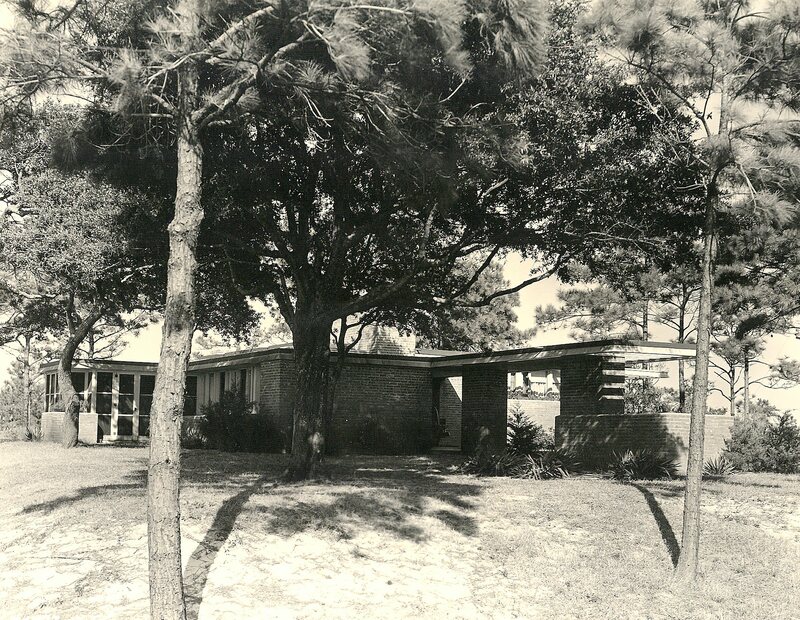 In 1928 or 29, Dow leased property on the cape Fear Peninsula 17 miles south of Wilmington. The peninsula at that point was about a mile wide, with the Cape Fear River on one side and the Atlantic Ocean on the other. There they built a pilot plant where they pumped seawater through a six inch pipe from the beach, acidified it, chlorinated it and distributed it at the top of a brick tower. There it trickled down through lath packing, a Herbert Dow development for contact between liquids and air. Air blown through the lath extracted the free bromine and carried it to another section of the structure where it was absorbed in recycled soda ash solution. G.F. (Brick) Dressel was responsible for the pilot plant, but Glen Cantwell operated it. Yes, both were Dow men from Midland. The product from this pilot plant was a bromide-bromate solution containing about 50,000 parts per million of bromine. This was about 700 times as concentrated as the 69 parts per million in seawater. While this was going on, the Ethyl Gasoline Corporation was looking for its own source of bromine. They leased a ship which they called “The Good Ship Ethyl” and sailed around the country testing seawater and working on a process for taking bromine out of seawater as tri-bromaniline. The concept was to chlorinate seawater to free the bromine, add aniline, and separate the tribromaniline by filtration. They were apparently unaware of acidification because John Grebe later got a patent on the process using acidification along with chlorination. As they must have found, fine mesh filtration of seawater is next to impossible. If you have ever tried to filter seawater through filter paper, you find that it is teeming with organic growth; you can get only a small amount through the paper before the growths plug it. For that or other reasons the tribromaniline process was not a success. So Ethyl got together with Dow and it was decided to form a jointly owned company, The Ethyl Dow Chemical Company, to take bromine out of seawater using the Dow process. Ethyl was to handle the finances and Dow would handle all of the production aspects. WAS THIS AFTER A PROCESS COMPARISON WAS MADE? HOW DID THEY ARRIVE AT THIS CONCLUSION? I guess that Ethyl gave up and that Dow was able to report that it had demonstrated the first step of the process and was certain that it could go the rest of the way. I am presuming this, for I was not a part of the bromine activities at that time. In any case, plans went forward to build a 10,000,000 pound per year ethylene dibromide from seawater plant at Kure Beach. Someone suggested that before they built the two big blowing-out towers, each of which had an area of about 3700 square feet, they should check the distribution systems, for many thousands of gallons per minute of seawater had to be evenly spread over these areas. This was 1933. 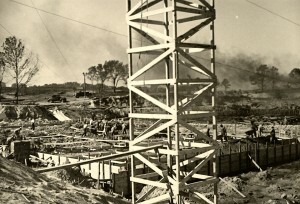 So Dow built a small section of a blowing-out tower using the design planned for the large units to check distribution. 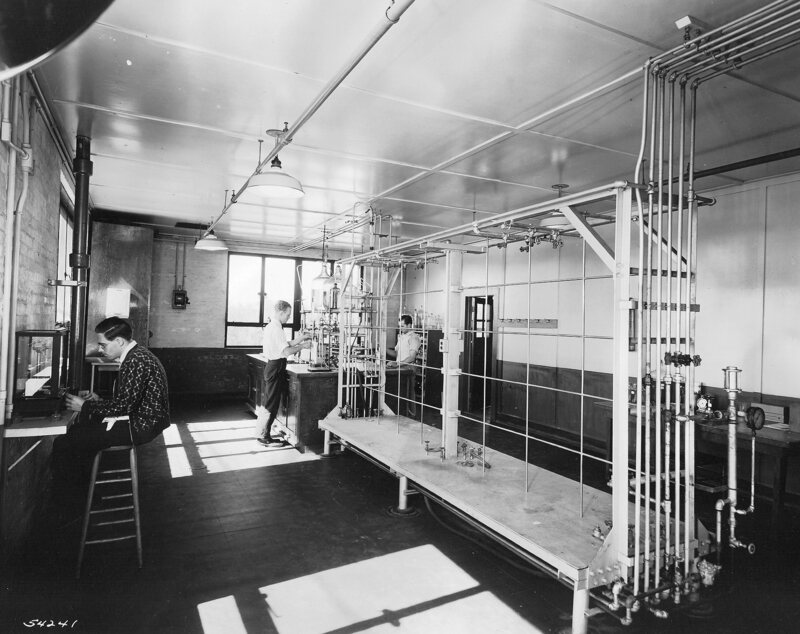 Heinie Langell had the responsibility for building the unit and testing it. It was at that point that, probably because he knew me, he had me transferred out of the Main Lab to help with the project. THE RESEARCH FOR THIS WAS STILL IN MIDLAND? Yes, it was in Midland, in an unoccupied section of an old bromine plant. My job was to calibrate the water flow orifice, run the unit at different rates, and check distribution by means of collection chambers at the bottom of the unit. The distribution turned out to be very poor, and I had to make a demonstration run for Mr. Harlow and Mr. Barstow so they could see for themselves. They told me to see what I could do to fix it. As a kid, I loved to play in the water. On my grandfather’s farm in Hart, one of my uncles would dam up a little creek for a pond, build me a raft, and I would paddle around on it. So playing in water again was great. They gave me the high school football coach as an assistant. We started checking at the top of the unit and learned that distribution was poor at the very top. 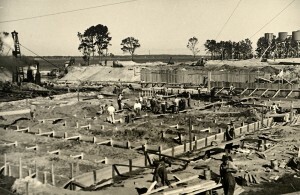 Distribution was accomplished by means of slotted ceramic tubes extending vertically though the bottoms of wooden boxes. The primary boxes had four tubes, each of which fed a secondary box with eleven tubes. We measured the flows from each of the tubes and found that irregularities could be corrected by installing baffles in the boxes. With the distribution at the top of the tower even, the distribution at the bottom was still poor, the water moving laterally as it passed through the lath packing. It was obvious that the rest of the problem was in the lath packing itself. I don’t know whether you were familiar with the lath packing used at Freeport. YES, THEY WERE IN THE OLD TOWERS AT ETHYL-DOW. The packs were tilted ever so slightly because the bottom comb was at an incorrect angle. The carpenter shop made us some shims. After we shimmed up each pack to make the angles equal, the distribution was good. Heinie and I designed some simple equipment which could be used in installing lath to assure the proper angles. Then they sent me to Kure Beach to help put the lath combs in the new towers. Heinie was in charge of the installation; he got the day shift. Art Asadorian from the Bromine Lab was senior to me, so he worked the afternoon. I got the midnight shift. WAS THIS STILL ON A TEST BASIS? No, this was the real thing. 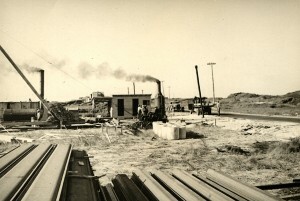 At the site of the old Kure Beach pilot plant, an intake structure was built. 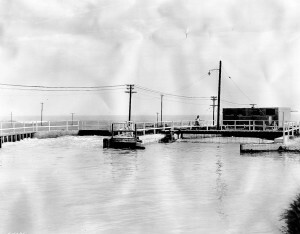 Seawater was drawn between two sheet steel piling jetties extending about 150 feet into the water, passed through a settling basin and through trash screens before entering large pumps. 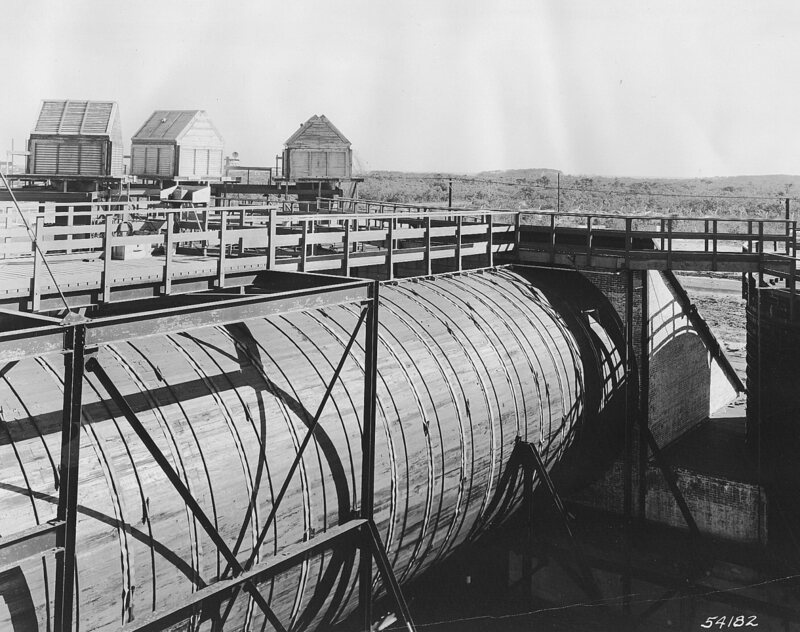 Each of the pumps delivered 30,000 gallons per minute to pipes which carried the seawater to an inclined dam, which we called the “hydraulic jump”. From there, the water passed through a short canal before entering a pond of several hundred acres where there was solar warming. 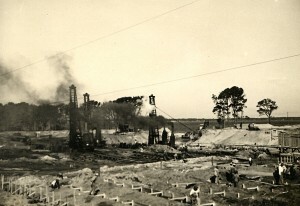 The pond extended about two thirds the width of the peninsula, near to the site of the bromine extraction units. The two blowing-out towers were brick structures about 50 feet high and each had about 3700 square feet of horizontal area. Physically connected to the blowing out towers were the brick absorption towers where the blown out bromine was absorbed by a sodium carbonate solution, as in the pilot plant. The de-brominated seawater would flow into the Cape Fear River, a tidal estuary. 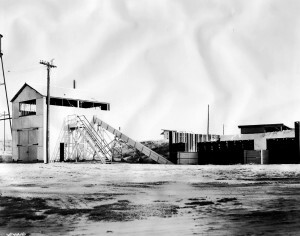 A short distance from the blowing out towers was a building which housed the steaming out towers which extracted elemental bromine from the product of the blowing out/absorption step, reactors for converting bromine to ethylene dibromide, and steam distillation equipment for final purification. Somewhat further away was the ethylene plant where ethylene gas was made by passing ethyl alcohol vapors over hot kaolin. Adjacent to that were the coal fired boilers which provided building heat and steam for distillation. 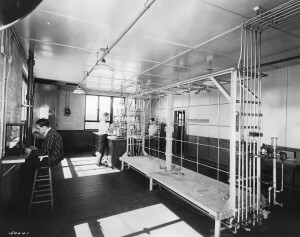 Engineering for the plant had been done in Midland, and responsibility for its construction had been assigned to a Dow man named Norris Coalwell. This was Dow’s first venture outside of Midland, and things did not go well. A storm destroyed part of the intake structure, an ethylene storage tank being pressure tested on a barge rolled into the Wilmington harbor, and the principal contractor “went broke”. Norris was not able to handle the deluge of problems and had a nervous break-down, so A.P.Beutel, then Willard Dow’s assistant was sent to Kure Beach to take command. And that he did; he was able to take setbacks in stride. 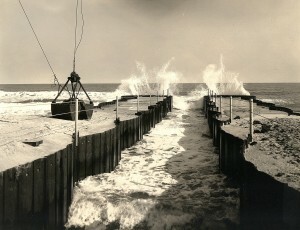 I drove to Wilmington in the fall of 1933 when the blowing out towers had been erected and were ready for the lath packing. 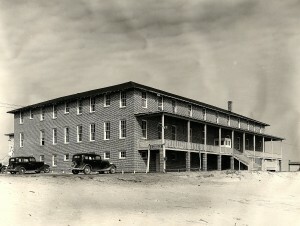 Dow had leased an old hotel near Kure Beach and most of the Dow people and their families stayed there. I was one of them. EDCCO Club had a dining room just for the Ethyl Dow staff and employees. 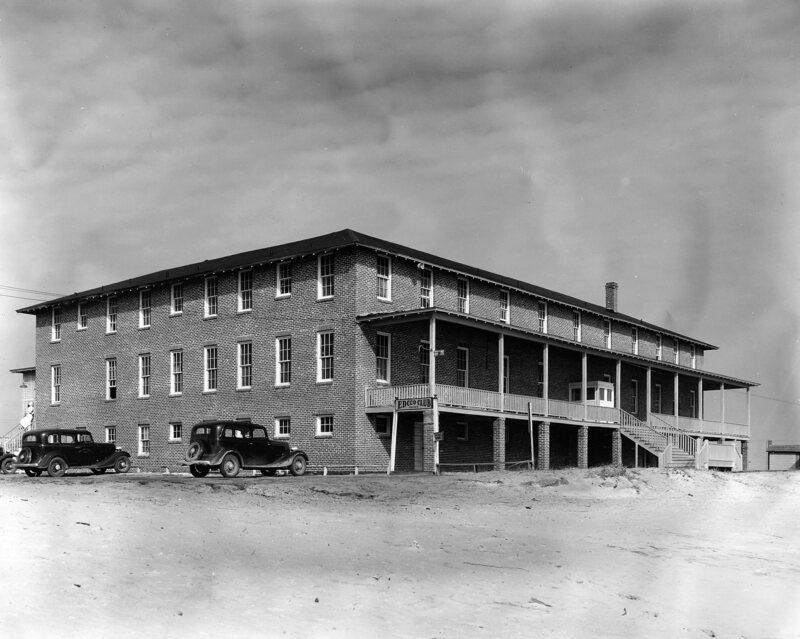 This building was The Breakers Hotel in Wilmington Beach, leased by Ethyl Dow for their employees. DO YOU REMEMBER THE NAME OF THE HOTEL? It was the old Breakers Hotel (Editor: The Breakers Hotel in Wilmington Beach) . We learned later that at one time it had been a brothel. One of the guys said he could not sleep for thinking what might have gone on in his room. The hotel, during our residence had a big dining room, named the EDCCO Club, where everyone ate. The number 1 table fed the top people: the Beutels, the Bransons (head of construction), the L.J. Richards (chief engineer), and the Willard Dows and Ethyl bigwigs when they came. That table had finger bowls and the services of William Polite, a distinguished black headwaiter who wore formal dress. The second table had some of William Polite’s time but no finger bowls. Of perhaps ten tables, I and some others were at the last table. More business was certainly done at the top tables but at ours we had more fun. We got the lath packing done, started the blowing out and absorption units and filled the storage tanks with the bromide/bromate solution, awaiting the startup of the second stage of the process. The second stage was the steaming out tower where the bromide/bromate solution was to be acidified with sulfuric acid and the released elemental bromine was to be distilled out and condensed. They were having trouble getting the second stage started so we just had to shut the blowing out towers down and stand by. Mr. Harlow was following the progress regularly, and I saw him occasionally. He came to breakfast one morning and said, “Shig, we did better last night; we only broke 13 condenser coils. The bromine was condensed in 14 thin walled ceramic coils. No, not then. Some years later we used Pyrex. What was happening at the steaming out tower was this, shortly after starting the unit, unexplained pressure would start building up in the condensers and within a matter of hours they would blowout. The plant would shut down, be repaired the next day, and the next night the same thing would happen for no apparent reason. Night after night this continued. One morning Mr. Harlow got in touch with me and said that the steaming out crew was worn out and that night I was going to have to run it. I did not know too much about steaming out towers. I had seen a similar unit in Midland and was there when they were testing a new condenser design using Pyrex glass and graphite tube sheets. The test lasted only a few hours, for the graphite was disintegrated by the bromine. I spent that day learning what I could about the new steaming out towers and where everything was. By six o’clock that evening the unit had been patched up from the previous night’s blowout, so they started it up and left me there with two operators. I was quite apprehensive. They had given me operating instructions, one of which was to maintain the excess acid in the tower effluent at 1.5 pounds per cubic foot. When they left me the excess was about 1 and the pressure was an acceptable 2 inches of water. The concentrated sulfuric acid was hand controlled by a little valve two floors up from the control room. I did all of the controlling myself, and not knowing how far to turn the valve to reach the 1.5 level I made changes so small that it scarcely changed. Meanwhile the pressure in the system remained at 2 inches. I continued to adjust the acid valve in almost negligible increments but the acid stayed at or near 1.0. I was doing the titrations on the effluent and was also able to determine the bromine remaining in it. The one pound per cubic foot of acid excess was getting the bromine out, and because the blowing out towers where the effluent would normally go were not running more excess acid would have been wasted. So I decided to leave the acid level where it was, the pressure stayed at or about 2 inches, and when morning came the plant was still running. It was the first time the unit had run all night. I was the “fair haired boy” for a while for having succeeded in making the tower run. Jack Chamberlain from the Midland Physics Lab was doing some work at the plant then, and he headed the investigation to find the reason for the success. To make a long story short, the chlorine addition to seawater at the blowing out towers was hand controlled and erratic because of surges in the chlorine system. Excess chlorine led to excess chloride, chlorate and bromate in the absorber product. The extra 0.5 pounds of acid released elemental chlorine which could not escape and caused the damaging pressure in the steaming out condensers. It was a lucky break for me that I happened to be there the night others had set the acid too low, but they gave me credit for taking advantage of it. Shortly after that I was asked to serve as assistant to Brick Dressel, Manager of the Ethyl-Dow plant. It was a fascinating experience. Brick was a wonderful man to work for and we worked well together. I was responsible for plant operations while Brick handled the business aspects, including contacts with the Ethyl Gasoline Corporation. Those were sometimes stressful because their ideas and those of Dow did not always coincide. WHAT WERE SOME OF THOSE DIFFERENCES? Initially Dow thought that all materials should be moved the 17 miles between the plant and Wilmington by truck, and they had figures to prove it. The Intracostal Waterway cut across the peninsula between Wilmington and the plant, so it was impractical to extend a railroad between them. 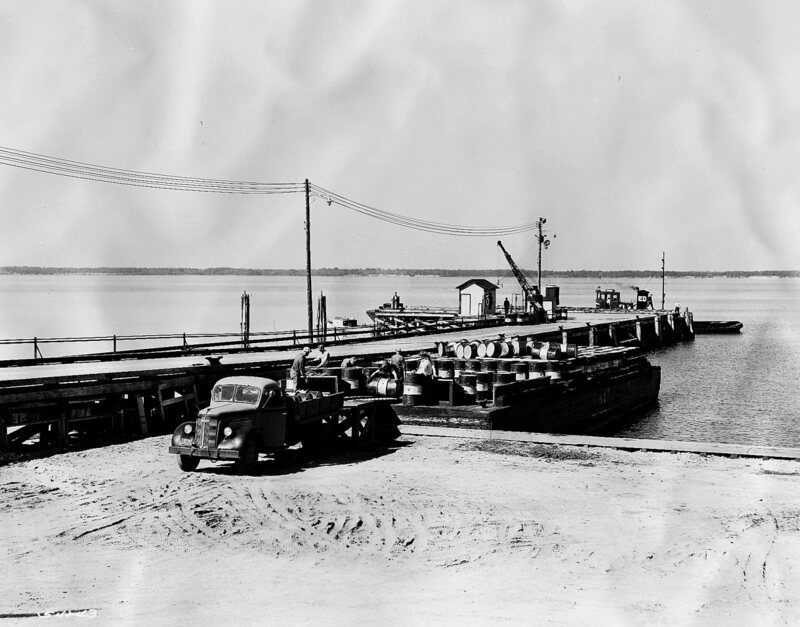 Ethyl was half owned by Standard Oil of New Jersey, which was water transportation oriented. So Ethyl said, regardless of the figures, water transportation was the best way. So that is the way Ethyl-Dow went. Ethyl-Dow bought a wood hulled vessel named the Vanessa, which had at one time been a rum runner. Pressure tanks were put in the hold to haul sulfuric acid, the acid being unloaded by air pressure. On deck were carried chlorine cylinders, soda ash, coal, coke, and drums of denatured alcohol to the plant. The drums, after cleaning, were used to ship ethylene dibromide. The denaturant in the alcohol was a material called “Dipples Oil”. It was present in small amounts but enough to give the alcohol a foul smell. 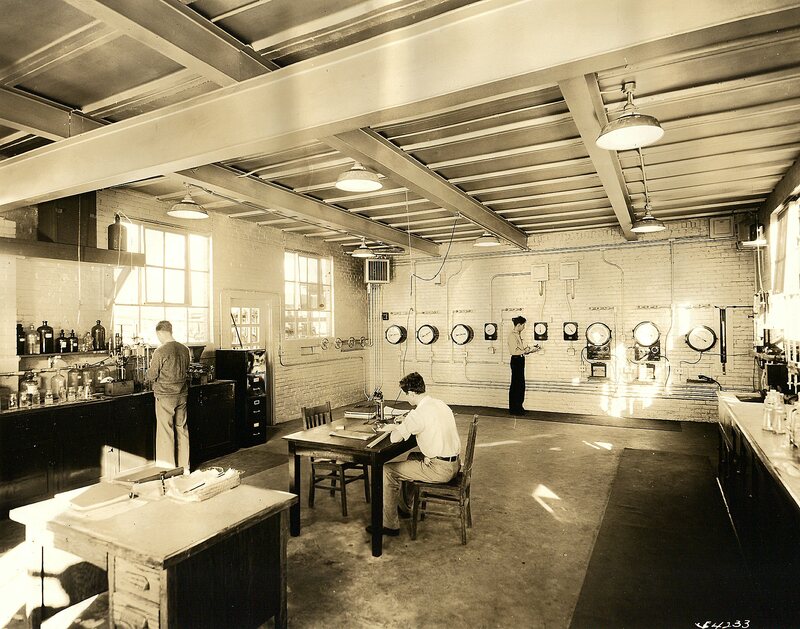 Early in 1935 it was apparent that the increasing demand for our product would require a plant expansion. In preparation for that, Ethyl Dow ordered a big barge and a new tugboat to move materials up and down the river. 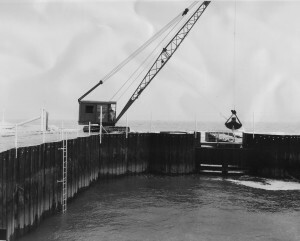 Brick wanted to handle materials on and off the barge with a single boom rig like a crane. Ethyl could not accept that; handling had to be done in the standard marine way where two booms were used. 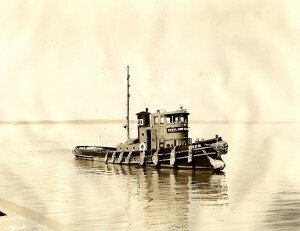 Ethyl Dow would have preferred a Fairbanks-Morse diesel engine on the tug, but Ethyl Corporation said it would be a General Motors Winton Diesel. The Marine Department of Standard Oil oversaw the design and construction of the tugboat, which had a pilot house control to start and stop the reversible 250 horsepower engine. Brick went to New York for the first trial run; returning to port the tug hit the dock very hard for the pilot house control did not function. That was not the only tug problem but I will get to that later. Let’s go back to 1934. The startup of this first plant to remove bromine from seawater received much publicity. Someone came up with the idea that a movie should be made of the plant and its process for educational purposes. As an added innovation, it was suggested that the film used for shooting should be made from potassium bromide, the bromine for which would be that extracted from seawater. Art Asadorian was assigned the job of making the KBr. He diverted enough liquid bromine to partially fill a large ceramic pot, reacted it with caustic potash in an open enclosure, separated and purified the KBr and sent it to Eastman Kodak. Eastman used it to make the film for the documentary of the process entitled “The Magic Key“. Copies of that film should be somewhere in the Dow files. I borrowed one and used it as part of a half hour “Minerals from Seawater” presentation I made at a Houston TV station in the 1950’s. The excess bromate problem having been brought under control, the Ethyl-Dow plant operated very well, slightly exceeding its designed capacity of 10 million pounds of ethylene dibromide per year. Operating problems were minor and most were quickly solved while others took longer. I was called to the ethylene plant late one evening when the operator noticed a strong odor of rotten eggs and a milky color in the reactor condensate. I ran tests in the laboratory and found that there was a sulfur compound in a new batch of kaolin catalyst which had just been put into some of the reactors. We dumped that kaolin and put in what we had left of the old batch. When Brick came in the morning, he called Midland where they had been making ethylene in the same way and using kaolin from the same source for many years without any such trouble. The kaolin came from Gordon, Georgia. The company supplying it was unaware of any changes it all came from the same pit. Before the day was over I was on my way to Gordon with a trunk full of analytical equipment. There my tests showed that there was one new area of the pit in which there was a sulfur compound of unknown nature or origin. So an area of sulfur free kaolin was dug by hand and hauled by mule-drawn wagons to a siding where it was loaded on a freight car for immediate shipment to Wilmington. I tested every wagon-load; it was 100 degrees in the shade, and no shade. Speaking of the ethylene plant brings back memories about alcohol. 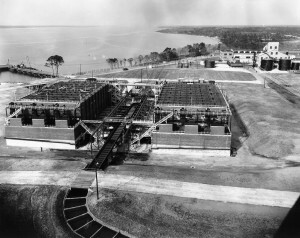 We learned from others that the property on which the Kure Beach plant was built formerly had a number of illegal stills making “North Carolina Corn” liquor. Carolina Corn was something special, having quite a reputation as a drink. Erwin S. Cobb once said that it had all of the qualities of swallowing a lighted lantern. One of my shift foreman told me that there were yet some stills near the plant and offered to take me to see them. But I had been deputized, as had Brick, so that was no place for me to be seen. The Alcohol Tax unit of the U.S. Treasury Department kept their eyes on us, for we were using large quantities of denatured alcohol. Their agents visited us frequently, and I would have to show them around as they looked for places where the alcohol could be illegally diverted. Ethyl alcohol was one of our more expensive raw materials, and I became aware that our alcohol/ethylene units were losing 5 to 10 of the feed alcohol in the condensate. This was going down the sewer, as it had in Midland for many years. I decided to see what could be done about that. From my Walker, Lewis and McAdams textbook, it appeared that we should be able to recover that alcohol by steam distillation. I went through some calculations and designed a unit to do the job economically. Brick thought we should run a demonstration pilot unit before asking for authorization to build the larger unit. So I designed a little pilot unit and one of my chemists ran it and collected the data. It worked just fine. The next time a Treasury agent came for inspection, I proudly showed him what we were doing. When I had finished, he said something like this: “My Gawd, man do you know what you have done? You have built and are operating an illegal still.” He then pulled a notebook from his pocket and proceeded to tell me the penalties for such a deed. I was shocked; you could have bought me for a nickel. But the agent was a fatherly type and said, that our intentions were good and that we should get back to the office and apply for a permit to do what we were doing. He asked what else we were doing that might fall into the same category. I told him we were steam distilling ethylene dibromide. HE SURELY DID NOT CONSIDER ETHYLENE DIBROMIDE AN ALCOHOL, DID HE? No, it was not an alcohol, but it was a distillation, and we had to have permits for such things. We even had to get a permit for the little Barnstead still in the laboratory, the unit for making distilled water. To conclude the alcohol story, we did get approval to build the full size recovery unit, built it, and reduced our alcohol losses to almost zero. Another problem which came to light about a year after the plant startup involved materials of construction. 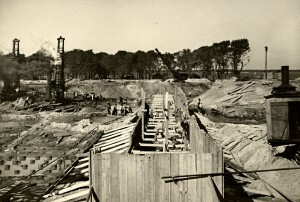 In the interest of economy, some of the seawater canals were lined with untreated wood piling. The Midland engineers were unaware of the appetite of marine borers for untreated wood. 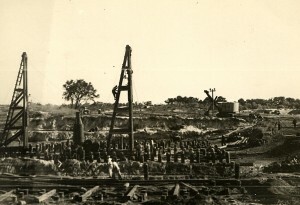 The teredoes, limnorias and martesias soon made sponges out of the wood piling below water level, and the wood had to be replaced by concrete at some inconvenience to production. Still another problem was the failure of the fine mesh “travelling screens” to prevent marine growth and debris from entering the blowing out towers and plugging the slots in the distributor tubes. Crabs, shells and small fish would cling to the screen panels as they rolled up, elude the cleaning sprays at the back, and enter the downstream water flow. The blowing out towers had to be shut down at least once a month to clean the distributor tubes. Almost all of the maintenance crew, painters, pipe fitters, electricians and machinists would go into the smelly tops of the towers to do the job. Everyone could be counted on to do what had to be done, regardless of their trades. It was some years later that we started using screens which kept the same side of the mesh always facing the incoming flow. In December of 1935, Brick Dressel received word that he was being transferred to Marquette, Michigan, to be the new Manager of the Cliffs-Dow plant there. I was to be the new Manager of the Ethyl-Dow plant. At that time I was engaged to be married to a lovely Wilmington girl named Mary Graham. Brick had been living adjacent to the plant in a house designed by Alden Dow overlooking the Cape Fear River. 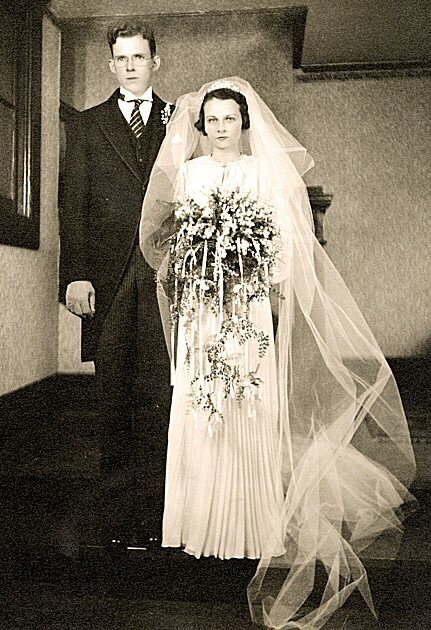 We were married February 8, 1936 and promptly moved into the house. When there was trouble for which I had to go to the plant in the night, Mary would put on her bathrobe and sleep in the car outside whatever unit was having the trouble while I worked inside. For a while, I was handling both Brick’s old job and mine. Then Henry Roebke became my assistant to lighten my load. Shortly after we were married, Willard Dow came for a visit. He seemed to enjoy getting around seeing people and talking with them. We always tried to keep the plant in good order, and the day before he arrived I checked to be sure that it was. At the intake I found one of my favorite operators busily cleaning shrimp instead of caring for the pumps. In the past schools of shrimp would occasionally come up on the screens and too often operators would leave their posts to clean them for themselves and others. In my youthful wisdom I had issued an order that there was to be no more shrimp cleaning on the job. For this disregard of orders I rebuked the operator severely and at length. When I ran out of breath he said to me, “Well, you see it’s this way. Your wife called me a little while ago and said she was having Mr. Dow for lunch tomorrow and could I please get her some shrimp?” That was one of several amusing incidents at the intake. We were pumping large quantities of seawater after it passed through the gap between the two jetties and was screened. Roller towel type screens were supposed to keep fish and trash from getting into the pumps but did not always do so. WERE THE SCREENS THE SQUIRREL CAGE TYPE? No, they were different. The squirrel cage idea came to me later as I was pondering the screen problem. Our first screens were articulated screen frames fastened to chains which ran on sprockets, forming a continuous wide belt of screens from below the water line to above it. The belt would move vertically up against the water flow, then over and down below the water again. Sprays on the down side were supposed to knock the screenings into a trough, but some stuff clung to the screen long enough to enter the down-stream flow. The intake screens were course mesh and a fish could stick its head into the screen and ride over the top. 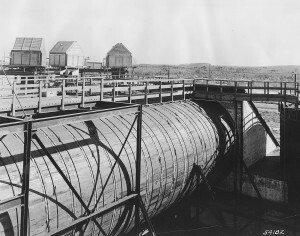 Some fish could survive passage through the big pumps, but others would be cut up and serve as food for the fish that did make it. Top of Hydraulic Jump where the Mayor of CB, councilmen & Baptist minister were fishing. The seawater entered the warming pond over the hydraulic jump and through a short canal. That was a great place for the fish to feed and the fish grew quite large. The hydraulic jump was an inviting place to fish, but we posted signs prohibiting fishing. If someone chanced to fall in at the time the pumps stopped, he would be sucked back into the pumps. We were at the end of a 110 mile power line and there were occasional power interruptions. There were indications that people were fishing at the hydraulic jump at night, so one night we decided to have the plant protection surprise them. The surprise was ours; we caught the Mayor of nearby Carolina Beach, one of the councilmen and the Baptist minister. All of our faces were red. Another time a big school of shad entered our intake basin. There were so many of them that they were practically pushing themselves out of the water. The screens could not handle that load, so many fish were carrying over and going through the pumps, some in parts. It was a feast time for gulls and they came from miles around. The high concentration of gulls attracted the attention of the Fish and Game Department and their representative warned me that unless the slaughter was stopped he would have the plant shut down. We were not sure how we could chase the fish out of the basin. We finally set bucket cranes beside the basin, shut the pumps down and let water flow back over the hydraulic jump while splashing the bucket in the basin. There was a slight flow out the jetties, and once some fish started to go out, the rest followed and the basin was clear again. JUST BOUNCED THEM OUT OF THERE! Our jetties extending out into the Atlantic Ocean gave us some concern because of their possible contribution to beach erosion. You know that wind driven waves move beach sand in the direction the wind is blowing. Sand moving along the beach could move as far as the jetties and then would have to go to the end of the jetties and deposit in deeper water. Waves would pick up more sand on the downwind side, thus scouring the beach. So concerned were we about our effect on the beach that, Brick had me take pictures of long stretches of the beach every month or so. One area of particular interest was a few miles south at old Fort Fisher where the beach was eroding quite badly. Wilmington was the last Confederate port to be closed during the Civil War because of its defense by the fort. In 1865 the fort was bombarded by a big Federal fleet but the fleet was driven off. 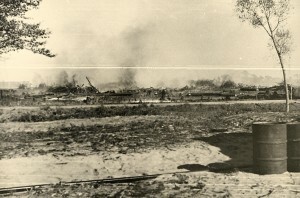 After storms, the eroded beach would be littered by relics of the bombardment, whole cannon balls and parts of cannon balls. I picked up many fragments and have given most of them away. Some months after the bombardment, the Yankees came back under cover of night, landed a force a few miles north of the fort, and built an earthen breastwork across the peninsula to defend against an army stationed in Wilmington. They captured the fort from the rear. 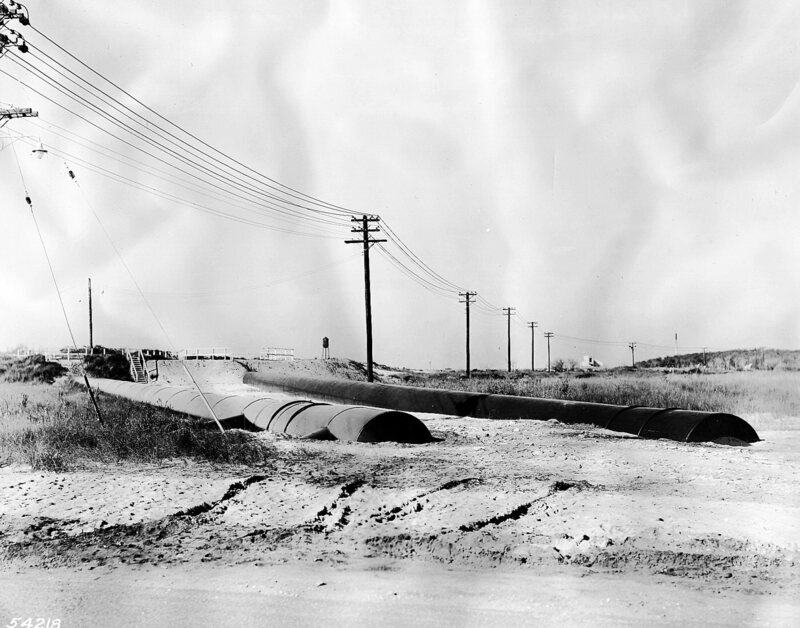 When the first bromine from seawater plant was built in 1933 the breast-work was used as one side of the seawater storage pond. This story about Fort Fisher has a personal angle. The girl I married was the granddaughter of the Major in the Corps of Engineers who had designed the gun emplacements. When the Ethyl Dow brick blowing out towers were demolished in 1952 much of the debris was hauled and dumped on the bank as rip-rap to defend what was left of Fort Fisher. When I became the plant manager in 1936, I was faced with a new problem. The new tug EDCO had a serious vibration at the RPM range at which it had to run to push the barge up the river on a falling tide. The head of the big engine would bob sideways between an eighth and a quarter of an inch. Specialists came from General Motors, collected reams of information, and said that the trouble was not with the engine. Hull people came and said that the fault was not with the hull. The propeller experts came, too, and denied that the propeller was responsible. So we were left with the problem with no answers from the experts. 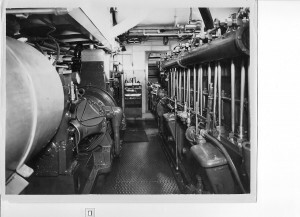 Dan McDonald, Superintendent of Maintenance, reduced the bobbing somewhat by putting braces between the head of the engine and the sides of the tug. But our insurers threatened to cancel our insurance unless we removed them. We were really hogtied; we had already given up the Vanessa because we were counting on the new tug and barge. The problem became my number 1 priority. I made several trips up and down the river in the tug measuring temperatures, speeds, engine RPM’s and engine movements. I sent the data to General Motors and requested performance information on the engine and was surprised to learn it could be safely run much faster than we had been able to run it. When we had run it over the vibration range, the engine overheated and froze some pistons. To me it seemed logical that what we needed to do was to put on a smaller propeller so we could run the engine over the vibration range without overloading it. At the very least, we should try it. In those days, money spent over a certain amount had to be approved by “Authorizations” by both Dow and Ethyl. I sent an Authorization request to Midland after talking to Mr. Harlow about it. My reasoning seemed logical to him, but he was not a boatman. Midland approved the request, but Ethyl balked. They said that the tug was properly designed and would not approve changes unless recommended by a qualified marine engineer. They said they would send down a vibration expert. Ethyl contacted the man who studied and solved the vibration problem on the tremendous French liner, the Normandy. He came to Wilmington at $400.00 per diem plus expenses. I met him at the train, took him to the plant, showed him my information, and took him on a trip on the tugboat. Within an hour or so he agreed that a smaller propeller should be tried. Mary entertained him for the rest of the day and he went back to New York that night. We got a new propeller as fast as we could, put it on, and it worked fine. The vibration range was still there, but we were able to run through it and above it to a vibration free rpm without overheating. Perhaps you remember the tug that was used for many years for moving oyster shell barges up and down the canal at Freeport. WHAT WAS THE NAME OF THAT TUG? It was the tug EDCO. It was bought by Dow after the Kure Beach plant shut down after the war. The deck house had to be lowered to get under the canal bridges. All of my tug information was given to Oliver Beutel, whose responsibility the tug became. 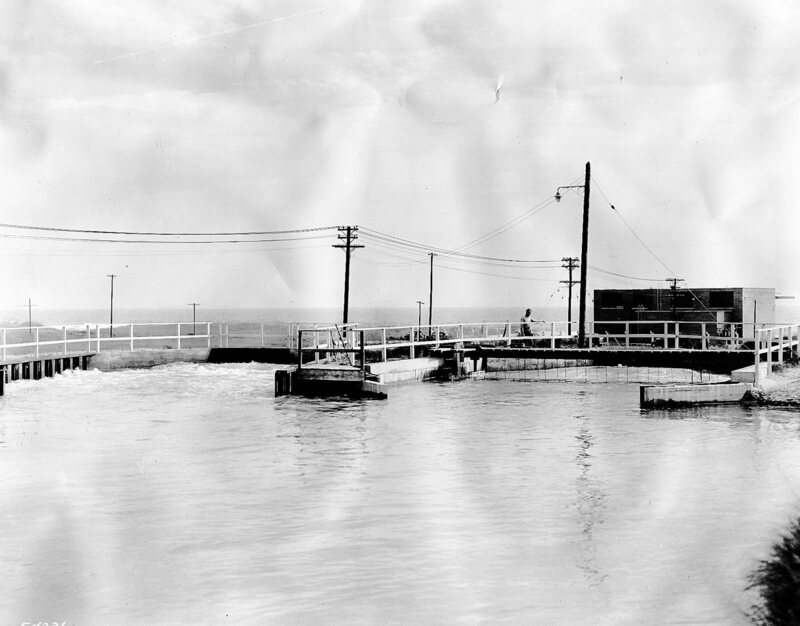 In 1936 we doubled the output at Kure Beach with new equipment and a different method which we called the SO2 process. The blowing out step was the same, but instead of absorbing the bromine laden air in a soda ash solution, it was mixed with sulfur dioxide in a long mixing chamber. The resulting hydrobromic and sulfuric acids in the form of fog and droplets were filtered out on glass wool. WHERE WERE THE BIRD BOXES AT THIS TIME? – ON TOP OF THE TOWERS? We called them “dog houses” because of their shape. There were no dog houses in the original design; they came later. The process had been conceived and pilot planted in Midland. WHO DID THIS WORK UP THERE? The Chemical Engineering Laboratory did the work. Ted Heath was the director of the lab, but Bill Schambra did the pilot plant job using sulfur dioxide from cylinders. 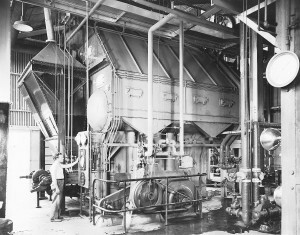 Our plant’s source of sulfur dioxide was rotary sulfur burners. When we started the plant, the fog coming out of the fans was substantial. We were putting hydrobromic and sulfuric acids all over the place. My wife remembers that the first night after the plant started I was out all night checking poles and trees to see how far the acids had gone. DID YOU FORESEE THE NEED TO TAKE IT OUT, OR DID NOT THE LABORATORY FORESEE THIS? They had not gone as far in the laboratory as to use sulfur dioxide from sulfur burners; they had only demonstrated that the reaction would go and that the product could be filtered out on glass wool and that on a small scale. Our big fans were condensing unreacted or unfiltered acids and spewing them out, so very quickly the dog houses were built over the fan discharges to provide another layer of glass wool to catch the acids. To make a long story short, we learned how to operate the sulfur burners in such a way as to produce a minimum of sulfur trioxide and the amount of material escaping the doghouses was reduced to a minimum. After the bugs were worked out, the new process worked well and provided us with some overall cost reductions. The new unit had other innovations. Bill Schambra had spent time at Kure Beach working on lath packing and he came up with what we called “Schambra Shim Lath”. This installed in the new blowing out tower permitted us to distribute more seawater and blow more air per cubic foot, thus producing more bromine. 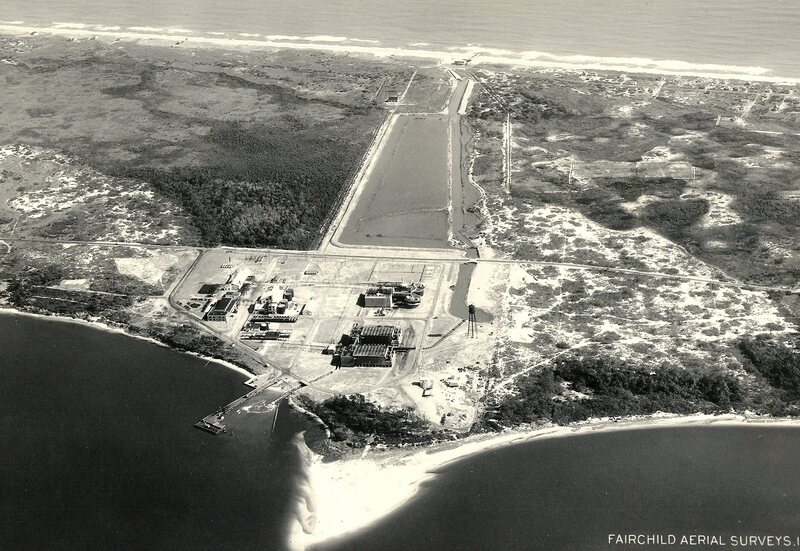 Scarcely had the 1936 addition begun operating when it was decided that still more ethylene dibromide was needed. 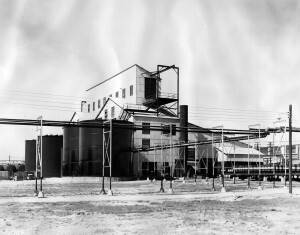 We had essentially doubled the original plant with the 1936 expansion. We redoubled it in 1938 with more intake pumps, a much larger blowing out and sulfur dioxide absorption unit, more steaming out towers, reactors, stills and ethylene units. We bought some more transportation equipment, this time another barge with deck tanks for moving de-natured alcohol and ethylene dibromide. The tug was running well so water transportation wise we were doing great, although we did experience one temporary problem worthy of comment. 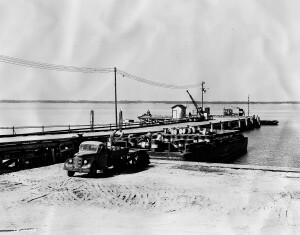 The Cape Fear River at the plant site was about two miles wide. The main ship channel ran north and south about two thirds the way across the river. Our shallower barge channel ran east and west and was maintained by dragging a heavy steel beam behind the tug on a falling tide. On one occasion when a government dredge was working upstream in the main channel, our own channel was filled with sediment too heavy for our tug and beam to handle. We felt sure that the big dredge was the culprit, so I went to see the chief of the Corps of Engineers Office in Wilmington. He denied any responsibility, so one of our chemists got samples of known dredge deposits; samples of the filled areas of our channel and samples distant from both. Analyses showed that the plug in our channel was identical to the dredge discharge. Confronted with that fact, the Corps of Engineers dredge cleaned out our entire channel, at no cost to Ethyl-Dow. In 1938 war clouds were gathering in Europe. The French and the British could foresee problems ahead and wanted their own source of bromine. So the French first, and the British later, contacted Ethyl to see if they could get the know-how for bromine from seawater. I recall the time when two Frenchmen came to the Kure Beach plant with Mr. Harlow. They came in the morning and were going to New York that evening for consultation with the Ethyl people. Mary and I planned to have them to dinner before they left. After we had been through the plant, Mr. Harlow called me aside and said that there were to be no more discussions about bromine until the meeting with Ethyl. He said they were going on different trains. Mary and I would take them to the stations and it would be Mary’s job to entertain them on the way. So after dinner we got in the car. I drove and Mr. Harlow sat with me in the front seat while Mary sat in the back with the Frenchmen and chatted with them about French cooking and other things. We put the Frenchmen on a train at Fayetteville and Mr. Harlow on a later train at Wilson, and came home. We were to learn later that negotiations were completed in New York and that the French would be given the know-how. Shortly afterward, Jacques Coulon, an employee of Establishments Kuhlman came to get information on the process. I met him at the train and took him to dinner. He could speak little English so we communicated with hand signals and what little French I remembered from college days. He was a Major in the French Anti-aircraft Reserves. Fortunately, we had an engineer, Morris McGowan, who had worked in Canada and who could speak some French. McGowan and Bill Schambra conveyed the process information and practically designed a plant for him at Port deBouc, near Marseille, France. I was scheduled to go there and help to start it, but the Germans overran it before the plant was finished. The plant was completed and operated. The man who was to have been manager of the plant was a Jew; the Germans shot him. I visited the plant and was shown through it when I was in France in 1960 with my family. There was a big plaque at the plant entrance remembering the dead manager. Coulon was in Paris at the time so I did not see him. It was running then, and as far as I know it is still running. The British also negotiated for plant know-how and Imperial Chemical Industries were contracted to build two bromine from seawater plants at points on the English coast. They were referred to as “Shadow Plants”. ICI sent three engineers to Kure Beach to get the information. They brought with them a trunk full of confidential information which they kept locked. At first they were very secretive, but as we became better acquainted they started opening up more and more. After the first Kure Beach plant was started, a Dow man named Leroy Stewart wrote quite an article about the plant in the April, 1934 issue of Industrial and Engineering Chemistry. The ICI man had studied that article carefully and had even sized piping from pictures accompanying it. They did a lot of work on the physical chemistry of the process, and actually knew more about the chemistry of seawater than we did. But they lacked materials of construction know how, particularly as wet bromine was concerned. They were somewhat chagrined to find that we had designed, built and operated the plant largely by trial and error and without detailed physical chemistry. Ultimately they gave us copies of their reports. 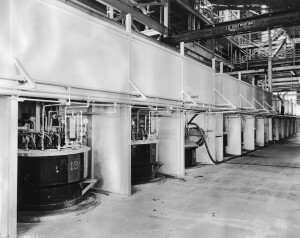 ICI did build and operate the two bromine plants. One was managed by Bill Venn, the leader of the three who came to Kure Beach. He wrote us occasionally during the war and told of the numbers of times he and others at the plant had to leave their posts to man anti-aircraft guns stationed at location. At least one of the plants was still running when I was in England in 1960 but I did not see it. WHAT DID Dow DO, SELL THE KNOW-HOW OR GET A ROYALTY? I do not know, but I have an idea that Dow received a down payment for-the know-how. I do know that bromine from seawater was a lucrative venture for Dow. Willard Dow told me that at one time DOW’s share of the Ethyl-Dow profits contributed one fourth of the total Dow profits. Initially we were making ethylene dibromide for 10 or 11 cents per and sold it for 30. 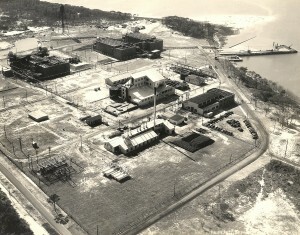 Our final capacity at Kure Beach was 48 or 49 million pounds per year and our production cost was under 10 cents. [Editor: 49 million lbs X $.20 profit per lb = $9,800,000. minimum PROFIT in 1940 dollars] All of the product was going to Ethyl, so there was a lot of discussion about pricing and about DOW’s contributions to lower costs. To assist in those discussions someone, perhaps from Ethyl wanted to get “standard costs” for ethylene dibromide. The job to get them fell on my shoulders. It was not simple; we had four units and two processes which operated at different efficiencies at a given seawater temperature. All of the efficiencies varied with seawater temperature and the rates at which the units were operating. Seawater temperatures varied from 30 degrees Centigrade in the late summer to about 10 degrees in the winter. The higher the temperature, the higher the efficiency and the higher the rate, the lower the efficiency. I had to unscramble those variables to arrive at “Standard costs”. So I set up a matrix and went through many hundreds of calculations on a 20 inch slide rule. I would take the work home at night and work until my eyes gave out, then start again the next day. Finally I developed a “standard cost” curve plotting costs versus annual production. This presumed optimum use of the several units running at optimum rates. Other curves were prepared to adjust the standard curve for changes in raw materials and power. Years later, after the bromine plant was expanded at Freeport, it was decided that my standard cost curve should be updated. I was out of Ethyl Dow by then and Bill Smith was given the job. Computers were available by that time, so Bill put all of the basic data in a computer, pushed a button, and in almost no time produced figures which had taken me weeks to get. The report was brought to me for review. I could not pass judgment until I had picked a couple of conditions, calculated them as I had before and checked my figures against Bill’s. They agreed. I think this would have been in the late 1940’s or early 50’s. Back to 1938 again, the use of tetraethyl lead for civilian and military use continued to accelerate and Ethyl was concerned whether they could get enough ethylene dibromide for it. So we started looking for another plant site. From the work Joe Bayliss had done, it appeared that the Gulf Coast was a good place to start. Two potential places were picked out for study, Corpus Christi and Freeport, TX. I am not sure who picked them, perhaps E.O.Barstow who had overall responsibility for Dow’s inorganic production. Barstow had been to both places, and Corpus Christi was his overwhelming choice, for seawater had higher salinity there and it was a nicer place to live. 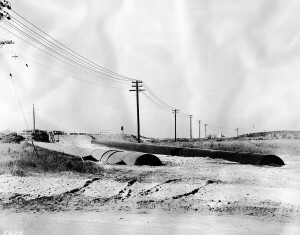 Freeport was a little, rundown village; it had holes in the roads that Porter Hart said would have had bridges across them had they been in Michigan. I sat in on many meetings where Willard Dow, A.P. Beutel, E.O. Barstow and Ivan Harlow debated the relative merits of the two sites for ethylene dibromide production. Bill Schambra and I did all of the economics for both sites. Bill was my right hand in those days. One day we were called into Barstow’s office where he gave us a real “dressing down”. He though he remembered that we had once shown the cost at Corpus Christi to be more favorable than at Freeport, and accused us of doing a little pencil work to shade the figures in favor of Freeport, the strong choice of Dow and Beutel. We must have convinced him that we would not have done such a thing, otherwise neither of us would have been around any longer. Freeport was chosen. I went there several times taking water samples, sometimes alone, sometimes with Mr. Harlow. We rented boats and went up and down the waterway and out in the gulf getting water at various depths, testing salinities with a special hydrometer. Surface water tended to be diluted by overriding Brazos flow, but at depths below about ten feet salinities were generally about 85% of that at Kure Beach. 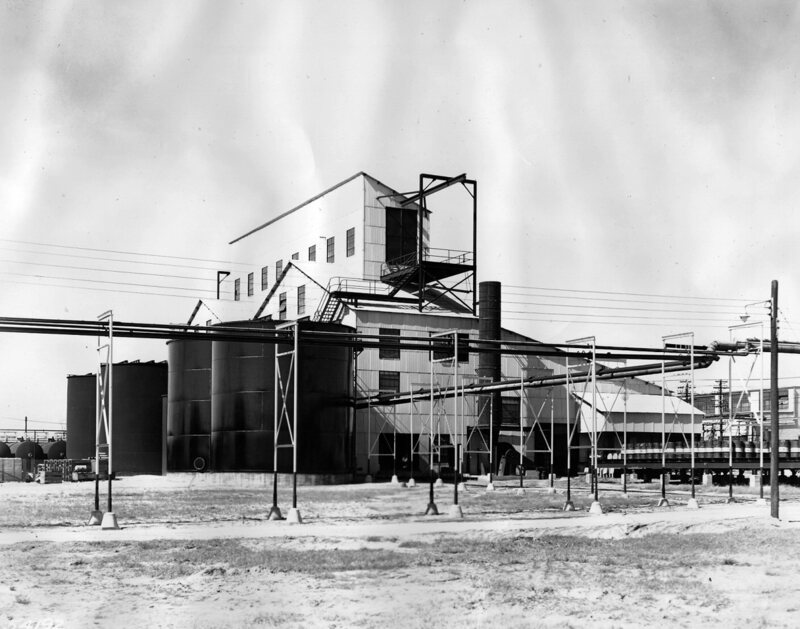 The initial concept was that Ethyl Dow would build the ethylene di-bromide plant and that Dow would construct facilities beside it to supply power, steam, ethylene, chlorine and caustic. But as Beutel and Dow looked more closely at the location, there appeared to be greater opportunities than just supplying Ethyl-Dow. There were nine or ten salt domes within a radius of 25 miles of Freeport, sulfur was being produced nearby, there was a deep-water port, a major river nearby, and cheap natural gas at one cent per thousand cubic feet. It would have been a mistake to have chosen Corpus Christi. As the Ethyl-Dow plant was being built in Freeport, it got to be a “tail on the dog” instead of the dog itself. Because of the advantages the Freeport location provided, Dow decided to produce other things, among them ethylene glycol, ethylene dichloride and magnesium from seawater. WAS THE VERY FIRST THING PLANNED IN TEXAS THE ETHYL DOW PLANT, AND THE MAGNESIUM AND OTHER THINGS CAME AFTER THAT DECISION? I think so. The consideration of Texas started with the need for expanded bromine production. There was no mention of other products in the Willard Dow-Beutel-Barstow-Harlow debates about Freeport and Corpus Christi that I attended. Those ideas came later, and suddenly we realized that there was much more going on across the fence than just supplying utilities for Ethyl Dow. I HAD HEARD IN THE PAST THAT THEY WANTED TO FIND A PLACE WHERE THEY COULD BRING THE SEAWATER IN FOR THE MAGNESIUM, MAYBE FOR BROMINE ALSO, IN SUCH A WAY AS TO TAKE IN FRESH SEAWATER, EXTRACT MAGNESIUM, AND THEN PUT THE SPENT SEAWATER INTO A CANAL THAT WAS A SIGNIFICANT DISTANCE FROM THE SEAWATER INTAKE WITH A MINIMUM OF BACK DILUTION. That is right. An effluent canal serving both plants was dug around Velasco to the Brazos River, which was a tidal estuary at that point. It was far more important for the bromine plant than for the magnesium. The first Freeport bromine plant produced 45 million pounds of ethylene dibromide per year using gulf water at the rate of 200,000 gallons per minute, while the first magnesium plant rated at 12 million pounds per year needed only 2600 gallons per minute. WHERE WERE YOU GETTING ETHYLENE AT THAT TIME? WAS IT STILL ETHANOL? I think we were counting on Dow for ethylene. I KNOW THAT IT HAPPENED, BUT I DID NOT KNOW WHEN. It seems to me that we built an alcohol ethylene plant as a standby. We certainly needed it, for Dow’s ethylene plant was up and down. In any case, the Freeport bromine plant was started up in late 1940 or early 1941 using the sulfur dioxide process, and it ran well. It had one innovation; we removed the chlorine impurity from the condensed bromine by adding a small stream of hydrobromic/sulfuric acid to the steaming out condensers, eliminating the bromine still we had used at Kure Beach. I was still in charge of both plants so I shuttled between them, spending a week or two at Kure Beach and a week or two at Freeport. 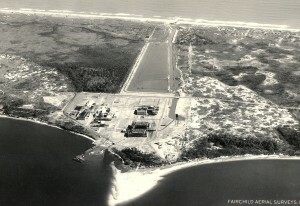 Henry Roebke was put in charge of the Freeport operation and Luther Evans was transferred from Kure Beach as part of his staff. Glenn Cantwell became the man in charge at Kure Beach. He had been involved with Kure Beach production since 1936 and before that had been the manager of Dow’s iodine plant in California. He was a senior man, having been a part of the operation of the mustard gas plant in Midland during World War I. He pitched for our plant softball team and acquired the nickname “Dizzy Dean”. YOU SAID YOU WERE COMING OVER AND STAYING PART OF THE TIME IN FREEPORT AND THEN BACK TO WILMINGTON. WHAT HAPPENED THEN TO CAUSE YOU TO HAVE TO MOVE TO FREEPORT? My move to Freeport came as a surprise. During a visit to Freeport in June, 1941, I was called to Dr. Beutel’s office. He said that some of the Dow plants were having serious problems and that he had arranged for my transfer from Ethyl Dow to Dow immediately to help solve them. From earlier chats with friends I was aware that things were not going well across the fence. There was a boron problem which had been partially solved, a cantankerous magnesium chloride shelf dryer which was limiting magnesium production and an ethylene plant which frequently broke down – and a 40 foot by 40 foot process storage tank tipped over. 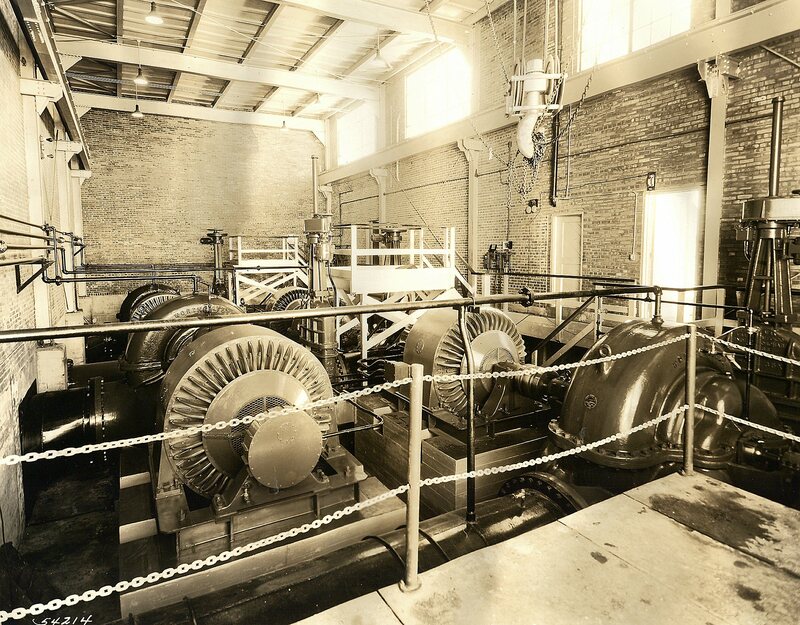 A Dow mechanical engineer named George McGranahan was the first Manager of the Texas Division as it came to be known, but seemed to be making little progress in getting things under control. So, much as he had done when the first Kure Beach construction got out of hand, Dr. Beutel came to Freeport to take charge. McGranahan was made responsible for maintenance and engineering. Nelson Griswold was transferred from Cliffs-Dow to handle power and utilities, and I was moved from Ethyl Dow to be in charge of all operations. The three of us would have the titles of Assistant Manager, and would be responsible to Beutel. Beutel promised me an increase in salary, but insisted that I be on the job “a week from next Monday”. That was only ten days away. I called Mary that night, and she got busy arranging for movers and putting our Wilmington house on the market. We had moved into town after our first daughter was born. We and our two girls, ages 3-1/2 and 1 were on our way to Freeport within five days and I reported to Beutel on the appointed Monday.